Stan Lee introduces Amazing Spider-Man #29 with the following words. What is the purpose of this panel? 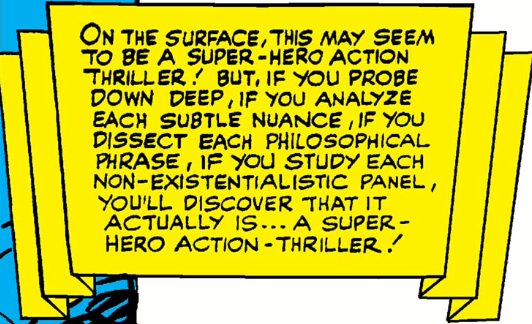 Why does Stan Lee introduce this particular superhero story with 50 words saying not much more than “this is a superhero story”? Why is this the superhero story into which he is particularly worried about people reading too much significance? And what the heck does he mean by "non-existentialist"? An existentialist thinks that human beings create their own meaning in an essentially meaningless universe. So I suppose a non-existentialist must believe the opposite: that life does have some kind of meaning and purpose if you are prepared to look for it. The Beatles’ German friends were described as “exis”, but this just seems to have meant that they thought you should challenge authority. Adrian Mole was a “nihilistic existentialist”, which meant he took “being bored” a stage further than everyone else. When I was at college a lot of people used “existentialist” to mean “gloomy”. The Christian Union took it to mean “all the bad things that people believe in this terrible modern world.” In this latter sense it has been largely replaced by “post-modernism”. 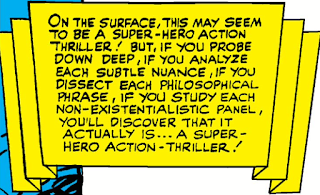 Peter Parker is a non-existentialist. He believes that his life has a meaning. He thinks that Someone or Something behind the scenes expects him to behave in a particular way. The name he gives to the Person Behind The Scenes is usually Fate or Destiny. But we know that its true name is Stan Lee. Parker’s belief in Luck and Fate is really the perception that he is a character in a comic book. It isn’t fickle fate that determined he would be at the science exhibition at the same moment the spider got irradiated. It isn’t blind luck that means that his life keeps getting tangled up with Doctor Octopus’s plans. And it isn’t destiny which forces him to carry on being Spider-Man even though the sensible thing to do would be quit. It’s all the fault of Stan and Steve who keep thinking up more and more far-fetched plot-devices to throw at him. Because if they didn’t there wouldn’t be a comic. Analogies between God and The Author have been a bit overdone, not least by me. I doubt if Stan Lee has read The Mind of the Maker or The Death of the Author. But he does talk about creating all the Marvel superheroes and resting on the seventh day. Being a writer and being God are sort of kind of the same. If you are a non-existentialist, then the universe has whatever meaning and purpose God intended it to have. So surely the Marvel Universe must mean whatever Stan Lee says it means. And what does the voice of Stan say? He says that every single panel has the quality of non-existentialism. It means something. But at the same time — in the same breath — he says that the comic has no deeper meaning. It’s just a comic. This comic means whatever I say it means. And what I say is that it doesn’t mean anything. How is that even worth saying? Amazing Spider-Man #28, #29, #30 and #31 were not published by Marvel Comics Group: they were published by Marvel Pop Art Productions. This is, I assume, a joke. But a joke is only funny if the people hearing it share certain beliefs. They all know that “comic” is a bit of pejorative term. They all know that Marvel comics are qualitatively different from DC and Atlas. And they all know what Pop Art is. Or, at any rate, they know that there is a thing called Pop Art, even if they couldn’t state the difference between Andy Warhol’s screen prints and Roy Lichtenstein found panels in any form that could hold water for five minutes. But what does it mean for Stan to stick a “Marvel Pop Art Productions” logo on his cover? Is he saying “Look! These really aren’t comics any more!”? Or is he saying “Isn’t it funny that some pretentious people think these aren’t comics any more!”? Quod scripsi, scripsi. Pow, zap, comics aren’t just for kids. Stan is very proud that clever people are studying his comics, but nevertheless wants to be seen as a plain ol’ joe who doesn’t understand a word of it. Betty-Anne uses pop art and dadaism (which were not at all the same thing) to introduce a fairly transparent exposition of Spider-Man’s appeal, which Stan Lee immediately conflates with psychoanalysis. The humanities — art, lit-crit, Freud — are all equally impenetrable to us mere mortals. Peter Parker wrote off art after one glance at a modern painting, and can’t tell the difference between a psychiatrist and a psychoanalyst. This is one hell of claim, if you think about it. "Writer" means “the guy who writes the dialogue”, and dialogue is what makes characters real. So regardless of who “dreamed up” Spider-Man or the Fantastic Four, Stan Lee is indubitably the one who makes the characters real. Stan Lee has admitted elsewhere that Steve Ditko “dreamed up” Doctor Strange without any input from him. But if anyone but Stan had been putting words into Doctor Strange’s – er – “little pink mouth” he might have said things like “Hocus pocus go to another dimension” or “Like, split to another dimension, man.” But as we all know, what he really says is things like “In the name of the dread Dormammu…” and “By the all-seeing eye of Agamatto…”. It is this vocabulary of authentic sounding magic words which makes Doctor Strange seem real. As Doctor Strange got more and more popular -- and what could be hipper than a Greenwich Village wizard -- some of the Betty-Anne's among his fan base started to wonder where Stan Lee had sourced all this magic vocabulary. So he told a white lie: he’d read very widely, and doubtless filled Doctor Strange with references and allusions at a sub-conscious level. This is the standard Artist’s Plea. My ideas don’t come from anywhere. There is no hidden meaning or subtext. I just made it all up. Out of my head. All right, all right. If you insist, maybe I put some hidden meanings in there subconsciously. But I really really didn’t. It’s all – meaningless. He’s riffing again. Hoggoth wasn’t the first magic word to be used in Doctor Strange, and it was never quite as ubiquitous as he suggests. No-one sensible – not even those imaginary college students – thinks that Lee had secret knowledge of occult forces and was hiding them in his comic book. But it doesn't quite follow that the phrase is “meaningless”. “Hoary” is a real word. It means ancient. It has connotations of whiteness and cold. It’s an old-fashioned word. We never use it accept as a conscious archaism. I suppose we could translate “hoary hosts of hoggoth” as “Hoggoth’s ancient army” or just possibly “Hoggoth’s ancient and holy bread”. But this isn’t what we hear. What we hear is more like “ancient-white-archaic-mysterious-religious-sacred-things”. We probably imagine Hoggoth as a venerable old man with white hair and a beard. It has echoes of Christian sanctity, but the lilting alliteration is the kind of thing a guru in an Arabian Nights market might say. Like Doctor Strange, it has one foot in a Western world of angels and devils, and one foot in an Eastern world of carpets and Turkish delight. You could doubtless play similar games with “agamatto” and “dormamu” and “vishanti”. Lee says that when he made the names up he relief entirely on phonetic: on what sounded mystical. But I don't think that there is any such thing as pure phonetics. Lee may never had read an occult text in his life, but his words mean things, however much he doth protest that they do not. Stan Lee wrote Spider-Man’s dialogue. So by Stan Lee's arguments, it was Stan Lee who mainly made Spider-Man seem real. But Steve Ditko was making up the stories and Steve Ditko had some very specific, very idiosyncratic, very deeply held political beliefs. And they were increasingly finding their way into his stories. We are only four issues away from The Final Chapter: Spider-Man’s supreme act of self-conquest. No-one reading that iconic episode would dispute that it means something: that Steve Ditko meant something by it. The young people on the internet who say “all that happens is that Spider-Man lifts something really heavy” are simply wrong. Stan must have been able to see what was happening. Stan must have known that left to himself Steve would have turned Peter Parker into the poster-boy for his newfound Randian faith. Would Stan have been relaxed about that? Using comics to say that hatred was bad and love was good was one thing: but using them to proselytize a specific political position was something else. So this breezy little joke is part of the Lee vs Ditko struggle, which is part of the words vs pictures struggle, which is part of the Peter Parker vs Spider-Man struggle. Ditko wants his comics to say something. Stan smiles and says that if you look carefully enough you’ll find that there is nothing to see. They really are just superhero comics and nothing else. A couple of issue later he admits that the “Pop Art” logo was a terrible, terrible mistake. When a writer tells critics not to bother interpreting his story, what he really means is that his interpretation is the only true one – that you have to read the story his way, or not at all. Some writers find deeply threatening the idea that there might be truths in the story they created which they themselves are unaware of. “This story is meaningless” is the cry of a creator trying to keep control over his creation. I assume that Lee had read Mary Shelly. He had certainly seen the Karloff movie. He quite explicitly evokes Frankenstein when recapitulating the story of the Scorpion. It isn’t mere a tale of science gone awry. It’s a tale of the Creation rising up against the Creator. Jameson created the Scorpion to destroy Spider-Man; the Scorpion wants to destroy Jameson; Spider-Man has to defend Jameson from the Scorpion. “I am doomed…” cries Jameson “Doomed by the very creature I myself unthinkingly helped to create.” The language can hardly be a coincidence. Ditko provided a splash page which encapsulates the super-hero action thriller side of the story very adequately. Jameson looks on helplessly as Spider-Man fights against the Scorpion (tearing up his office) in the process. Stan Lee could have underlined this, say by repeating the blurb from last issues letter page “A fighting mad Spider-Man battles to protect his worst enemy.” But instead he looks through the image and sees the deeper meaning. The Creation that the Creator has lost all control over. Lee’s 50 word introduction is one last attempt to take back control over the character he created. Helped to create. And he knows it won’t do any good. He is J. Jonah Jameson. His office has been flattened. Fifty years in the future people he has never met will be discovering new ways in which Spider-Man #29 is something more than a superhero action thriller. "... even if they couldn’t state the difference between Andy Warhol’s screen prints and Roy Lichtenstein found panels in any form that could hold water for five minutes." When do you think Ditko read Ayn Rand? Presumably, it matched his philosophy anyway, so at some point his thoughts solidify and have a basis in the books he has read. Since at some point it is the underlying cause of their split, where do the explicit hints start appearing?